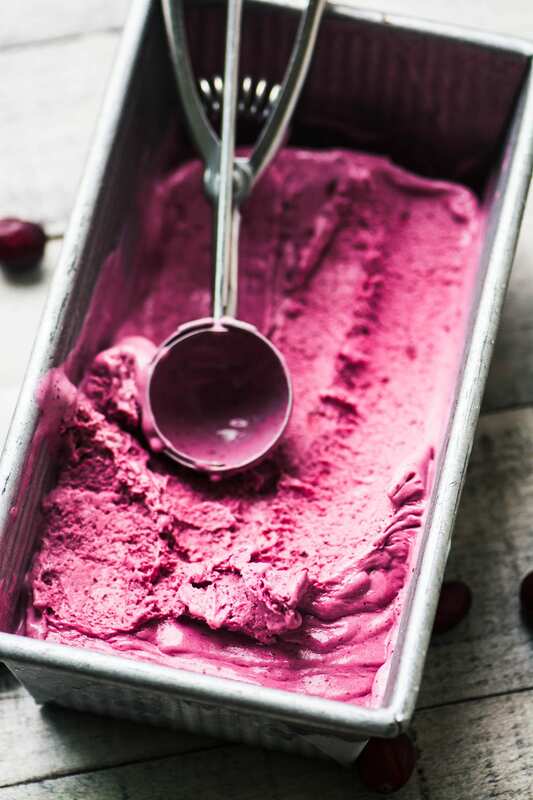 No Churn Cranberry Ice Cream ~ this easy seasonal no churn homemade ice cream is a refreshing option for holiday pies and takes à la mode to a whole new level! I love to make homemade ice cream with seasonal ingredients no matter what time of year it is. There are so many great ways to infuse the fall and holiday season into ice cream…I’ve made PUMPKIN PIE ICE CREAM, both no churn and regular versions. I’ve made MAPLE WALNUT ICE CREAM, which is always a hit on my holiday pies, and NUTMEG ICE CREAM and CARDAMOM ICE CREAM are a couple of my favorites. You won’t find these flavors in the ice cream aisle! 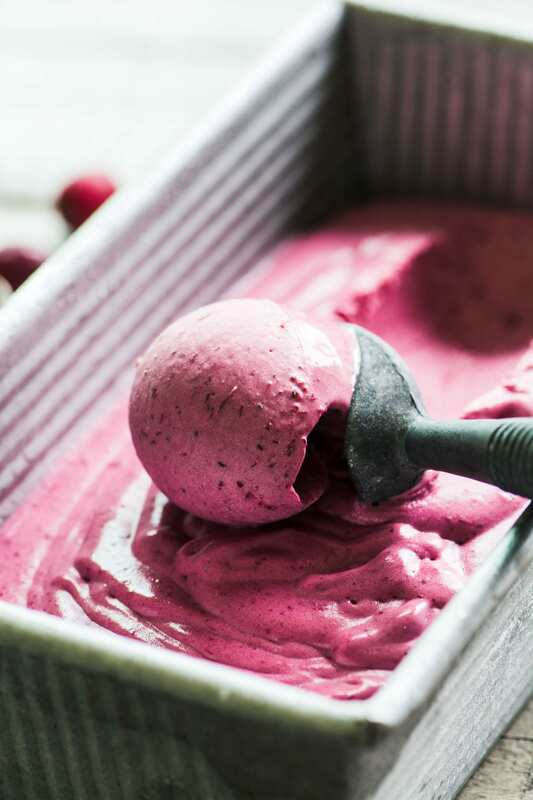 With no churn recipes there’s no excuse not to get in on homemade ice cream, you don’t need any special equipment other than a food processor, blender, or electric beaters to whip the cream and get everything mixed together before freezing. I used sugar and a little lemon juice to bring out the flavor of the cranberries. The sugar and cream reduce the bitterness of the berries, and the resulting flavor is mildly tart and fruity. 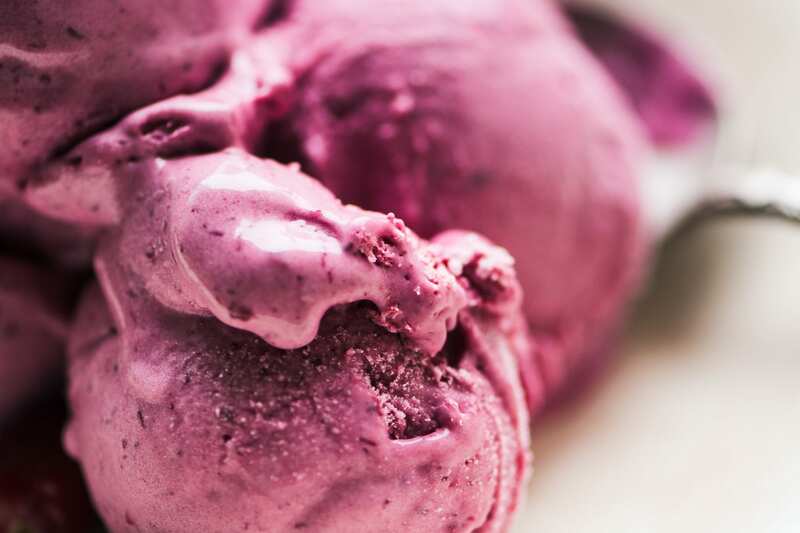 TIP: No churn ice cream tends to be very rich because it doesn’t get air incorporated into it as it freezes, which is what an ice cream maker does. For that reason I recommend serving it in small portions sizes. In my photos I scooped out more than necessary! What? You just want plain old vanilla? I’ve got that for you too: NO CHURN VANILLA BEAN ICE CREAM. I like to spread my ice cream in a thick walled metal loaf pan for freezing. It protects the ice cream as it freezes, and provides a long surface for scooping it out later. The same pan works for quick breads and meatloaves, too. Put the cranberries, sugar, and 1/4 cup water in a saucepan and combine well. Heat to a full boil, stirring often, and then let bubble away for about 8-10 minutes until the cranberries have burst and the mixture is thick. Stir in the lemon juice. Let cool for a few minutes and then puree in a high speed blender or food processor. Put the puree in a small bowl and refrigerate (I put mine in the freezer to speed up the process) until chilled. Put the cream in your clean blender or food processor and process until whipped, this will take just about 45 seconds, depending on your machine. Add the cranberry mixture and the sweetened condensed milk and process to combine. Scrape down the sides of the machine if necessary, and don't process too long, just enough to get everything mixed well. Pour the ice cream mix into a loaf pan or other container. Cover with plastic wrap and freeze for at least 6 hours or overnight. If you want to use an ice cream maker, use half & half in place of the cream and condensed milk. Combine the cranberry puree with the half & half in a blender or food processor and then proceed according to your machine’s directions. 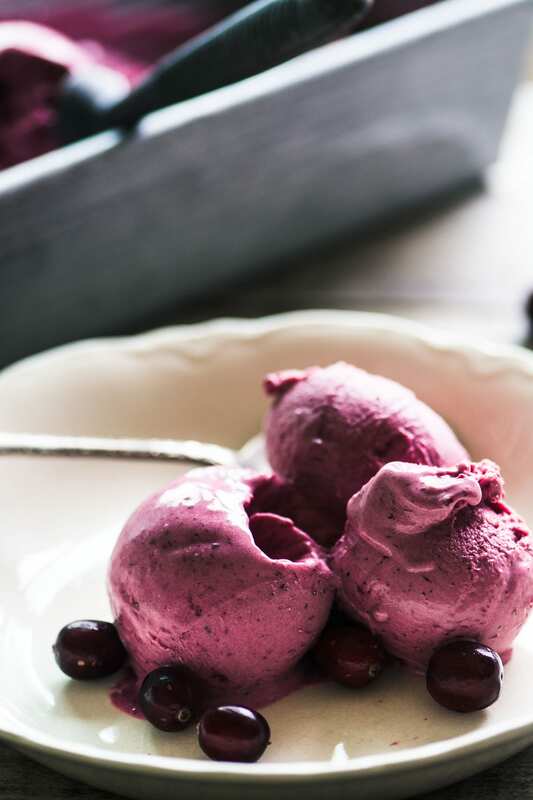 Don’t forget to pin this no churn cranberry ice cream for the holidays! Most recipes for no churn call for two cups of heavy cream to the can of condensed milk. Would that work in this recipe? It may reduce the heavy flavor of the condensed milk. Many other recipes like this call for two cups of heavy cream. Is there a reason why you have only one? I’m wondering whether that would temper the flavor of the condensed milk? I like to emphasize the fresh cranberry flavor, for one thing, and cream really dilutes that. You can certainly add more if you like, and you’ll get a bigger batch of ice cream that way. Hi there! I have made a couple different flavors of no churn ice cream, and i find the sweetened condensed milk to be very over powering…is there an alternative? I’m really not wanting to deal with an ice cream maker! That color is stunning – two scoops, please! Stunning! Such a great ice cream treat for this time of year. And of course, never any shortage of cranberries in my area :) Can’t wait to try! This looks so delicious! 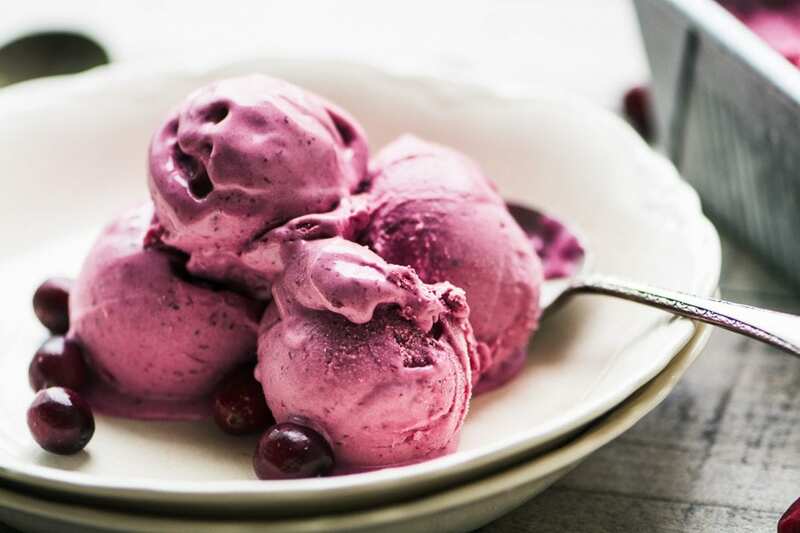 I’ve never had cranberry ice cream. The no-churn idea makes it all the more tempting. this is a first! beautiful! This has to be the prettiest ice cream I’ve ever seen! It would be so fun to have in the freezer for easy desserts during the holiday. 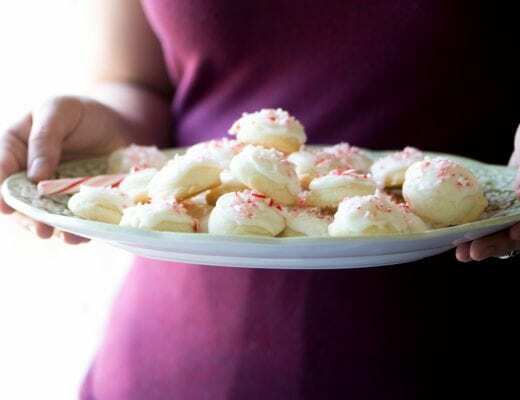 I’m imagining it with some wonderful shortbread cookies, yum!!! What a gorgeous color and dreamy, creamy ice cream. Perfect fruit for this time of year – cranberries are about to be everywhere :) Thanks for sharing this lovely recipe! Hello …this looks incredible and I love the color too! Before making …I am curious if this is terribly tart as cranberries can be? I am concerned it will be cloyingly tart …too much for people’s palates. Does the added 1/2 cup sugar keep it from being overtly and inedibly tart? Also …is it possible to vary the cranberries with another fruit (i.e. blackberries or blueberries or strawberries)? 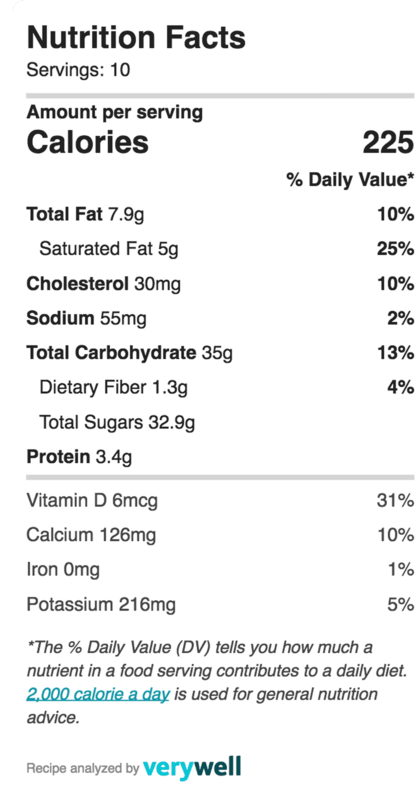 If using a milder (read: sweeter) fruit, is the added 1/2 cup sugar needed? I would love to make this as a surprise for Thanksgiving …would love a response. Your website is great …thanks for the “healthier” recipes! 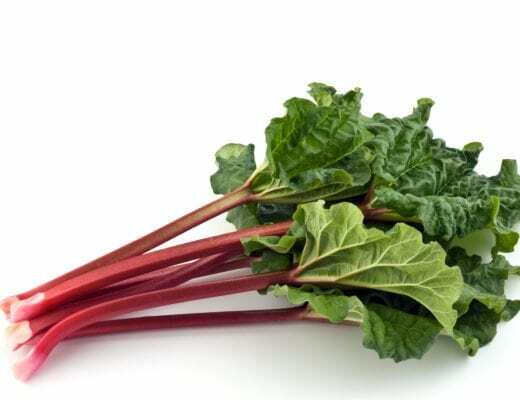 Hi Kelly ~ it’s interesting about the tartness of the cranberries. I first made this with 1 cup of sugar and found it to be too sweet. 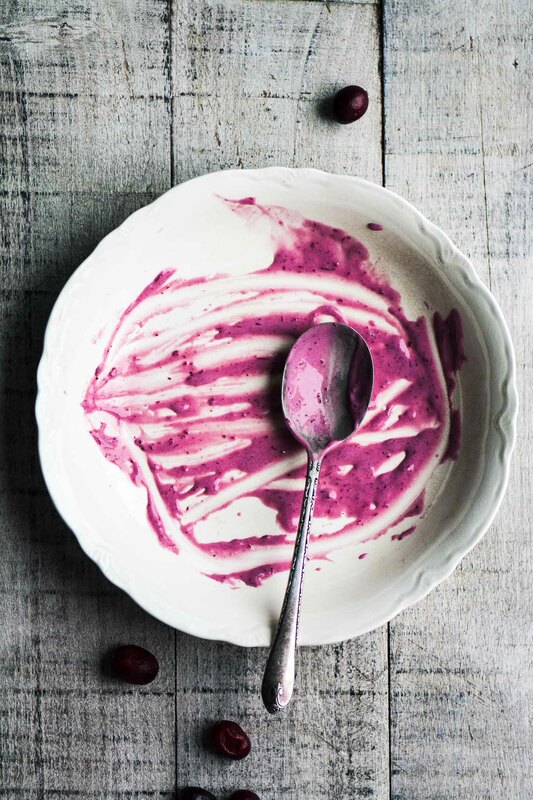 With cranberries you need a little bit of that tartness to distinguish their flavor. The cream tempers that, as well. 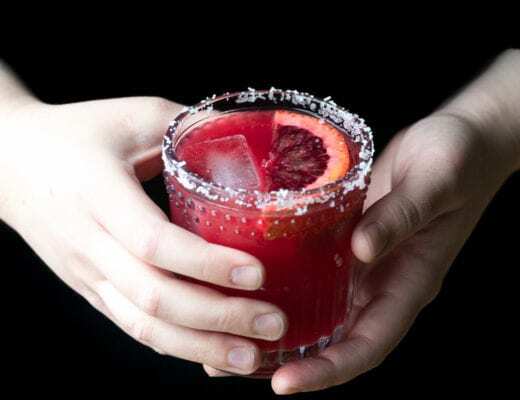 And yes, you can use all kinds of fruit in a recipe like this. Most of the time I would cook the fruit down to remove some of the natural moisture and to concentrate the flavor, almost like making a jam. Then cool it, and mix the same way. I love all your cranberry recipes. Pinned for the upcoming holidays. Thanks Gerlinde, I can’t wait for fresh cranberries every year. Is it too early to say ‘happy holidays’?? So creamy and the colour is just amazing!